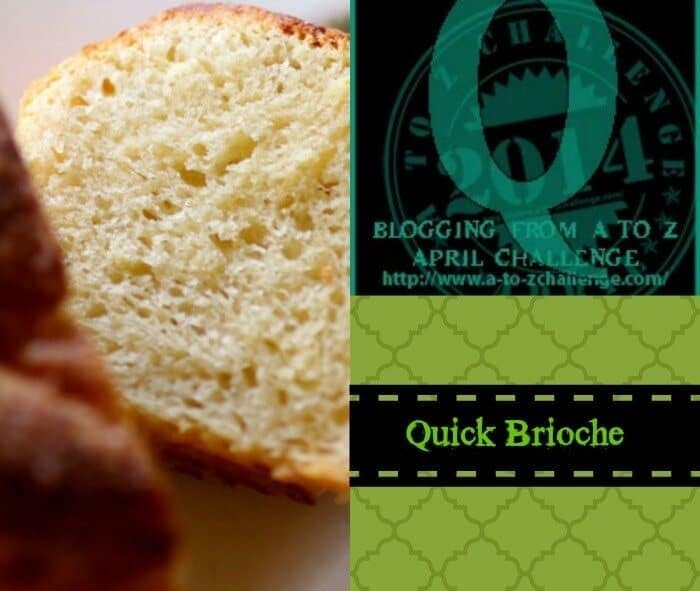 What would you give for a quick brioche recipe? A brioche that is buttery, slightly sweet, tender, and takes only a few hours instead of the typical overnight rising is a valuable thing — if you love brioche as much as I do. Brioche is traditionally baked in a fluted pan that looks like a big cupcake liner. It has a topknot and is cut in thick slices and spread with luscious things like sparkly, sweet raspberry jam or tangy orange marmalade. 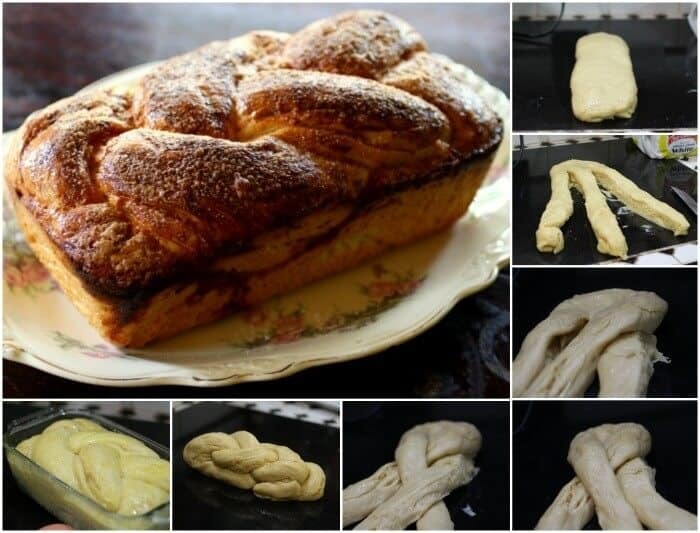 Sometimes you’ll find it in individual sizes but this one is a braided loaf. It isn’t difficult to make and it can be used to make the most mouthwatering French toast on the planet. You can make regular toast, too. There’s no way around it – any brioche is going to be high in fat from the butter and eggs, plus for this quick brioche recipe I’ve used cream rather than milk to give it even more richness. This is not low calorie and it’s not supposed to be. It’s a once in awhile treat so be sure to keep it that way or your hips are gonna tell the tale. You don’t have to braid this but it is pretty. After it has risen the first time press it down and roll it out into a loaf. Cut it into three strips but leave them together at the top. Now just braid the strips just as if it was your daughter’s hair. when you get to the end fold it over and tuck it underneath. It really is that easy. Use an egg glaze on this. It gives it a satiny finish and a beautiful color. I like to sprinkle the glaze with sugar but you can use sesame seeds or almonds or whatever you like the best. Like most bread it is important to let it cool before cutting to avoid crushing the crumb. 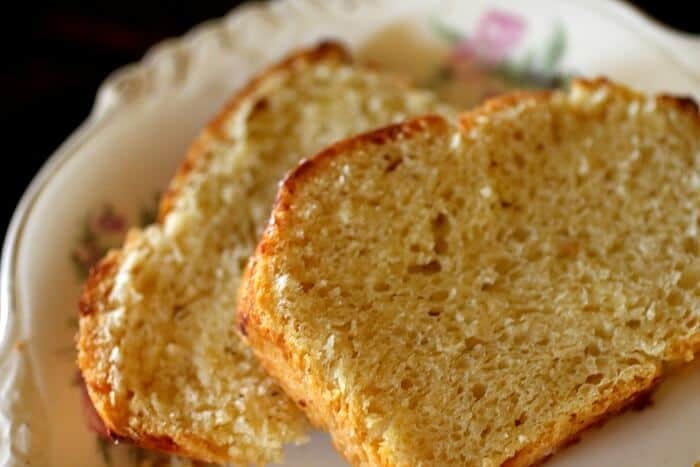 I really hope you’ll try this quick brioche recipe. It’s a good one to have tucked in your recipe box. 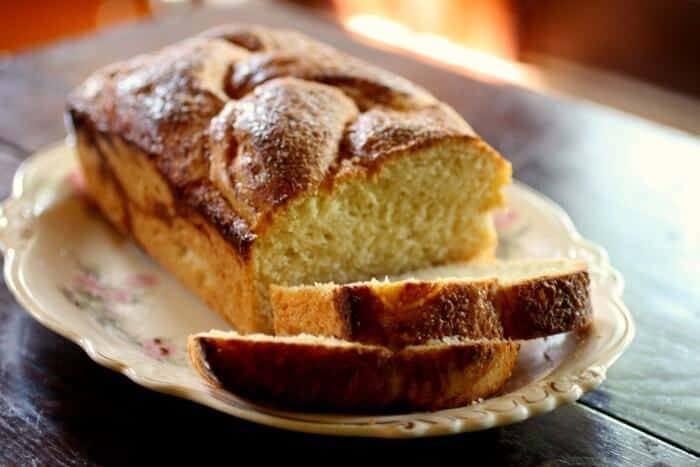 An easy, quick brioche recipe that is rich and buttery even though it take a fraction of the time that conventional brioche do. It is just right for French Toast as well as hundreds of other things. Combine cream, sugar, vanilla, and yeast in the bowl of a stand mixer and mix until well blended. Add the 3 eggs and melted butter to the mixture and blend. Add the salt an bread flour. Knead until the dough is only a little sticky, about 5 minutes. Shape into a ball and place in a greased bowl about twice the size of the dough. Cover with a tea towel and let rise for 1 1/2 hours. Form into a loaf shape and make two vertical cuts down the loaf, making 3 strands of dough still attached at the top. Place the right strand over the middle then the left strand over, and so on just like you were braiding hair. When you get to the end tuck the end under and place in a greased bread pan. Mix the egg yolk and 2 tablespoons of whipping cream until smooth. Lightly brush over the top of the dough. Let stand 10 minutes and then brush the glaze over the top again. Sprinkle with sugar if you like. Bake 20 to 30 more minutes or until the bread tests done. Let cool in pan for 5 minutes and then remove from pan to cool completely. Just made this! I substituted the bread flour with Unbleached all purpose flour and added almonds, sesame seeds and powdered sugar to the top! It’s AMAZING!!! Great for a grilled cheese;) I also bought some bread flour to bake this again next time to see if it improves the already amazing taste! Thanks for your great recipe!! You should try.. it’s really good! THanks! Let me know how it works for you! A loong time ago, when Cuisinarts were first available in the US, there was a recipe in Bon Appetit (I think) for brioche made in a food processor. I never made it but I am going to try yours for sure! Thanks for the braid tutorial too! I adore brioche! This quick version needs to happen in my kitchen soon! You are amazing! This bread looks SO perfect!! !